Vegan food has become quite popular in recent years and has gained respect not just because of animal welfare but also for culinary reasons. Indeed, most people might know savory vegan cuisine since many dishes from the Mediterraneans or from Asia are prepared without dairy products or eggs anyway. 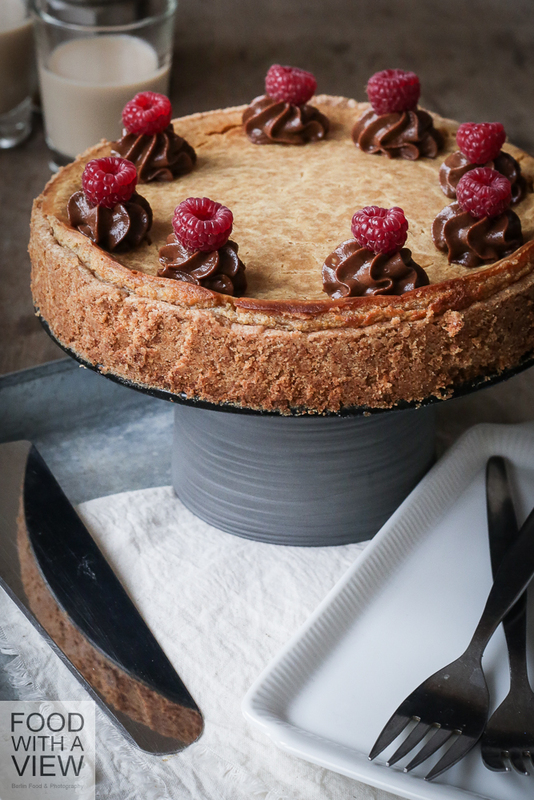 But when it comes to sweet vegan baking, the party is over at the latest when cheesecake is on the agenda. Am I right or am I wrong with this? 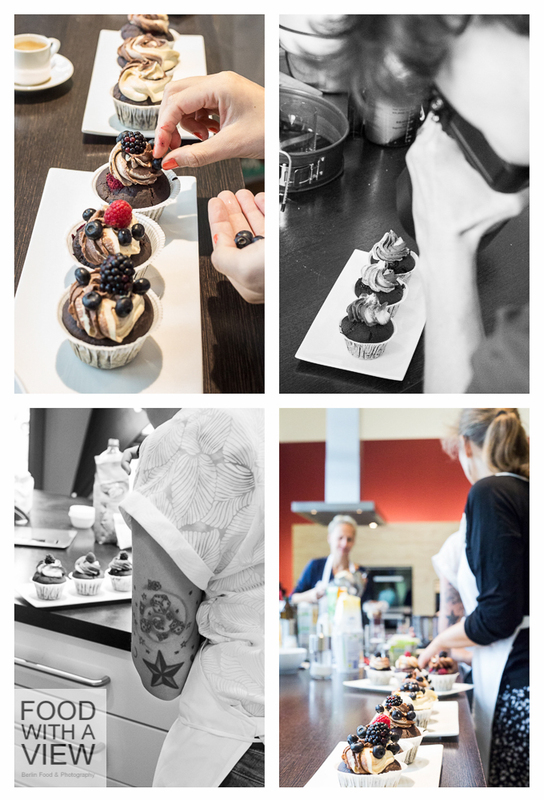 To find out, me and a couple of other curious bloggers – both vegan and non-vegan – met Nicole Just, author of „La Veganista backt“, upon a vegan baking workshop in Berlin organized by Munich-based publishing house Gräfe und Unzer. Some ten years ago, I was on non-dairy and egg-free diet myself for about a year. This is long gone, but still I am aware that butter & Co. are animal products – which I love and nevertheless try not to make too much use of in my everyday cuisine. Mostly, it happens all naturally and without a „vegan plan“ since pasta and vegetables for example – one of my Monday to Friday staples – are dairy-free all by itself, isn’t it. However, I can’t really make friends with fancy products like vegan „cheese“, and therefor I was quite curious whether vegan baking would rely on substitutes or find an original approach on its own. The weekend started with a get together dinner at Kopps, one of Berlins refined vegan restaurants, and we took the wonderful opportunity to get to know each other as well as the most friendly Gräfe und Unzer team – who encouraged us to ask everything we would like to know about the publishing industry. Well, that’s quite a food blogger’s topic, right, and thus it had been a long evening with interesting conversations. Regarding the food, I remember a lovely appetizer with savory lentil crisps and aromatic pickled cabbage as well as a rich and fruity soup of figs & tomatoes, accompanied by a very nice pinot gris of “Hand in Hand” winery. Lucky us – our baking workshop next day started with fresh green smoothies and a savory treat that our host Nicole had prepared for us to prevent us from sugar overdose before noon. 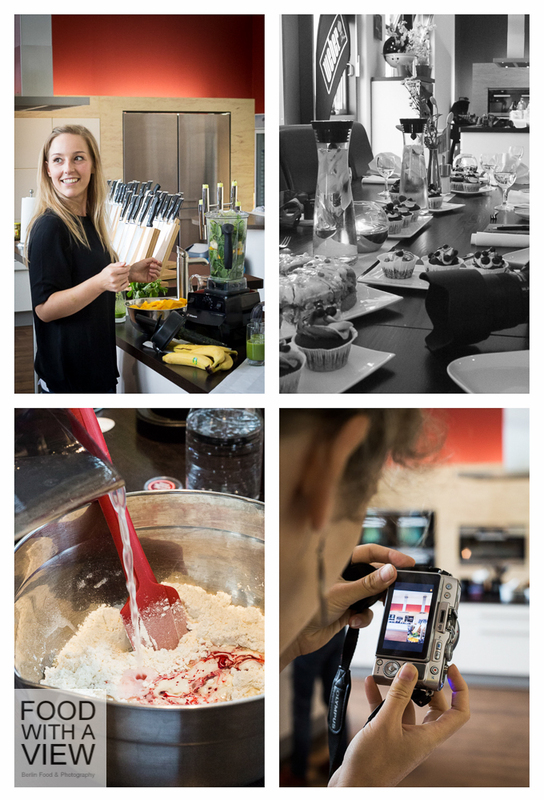 While we were snacking, she told us a bit about her life as a food blogger, a dinner club host at MundIArtIBerlin, a book author and a vegan cuisine traveler – impressive multitasking, isn’t it –, and of course we learned some first lessons on vegan baking. There’s not one option to substitute eggs, for example, but many – from mashed apples to soy flour. Also, vegan doughs should not be treated too much since they won’t rise well subsequently – better let sparkling water to the job. 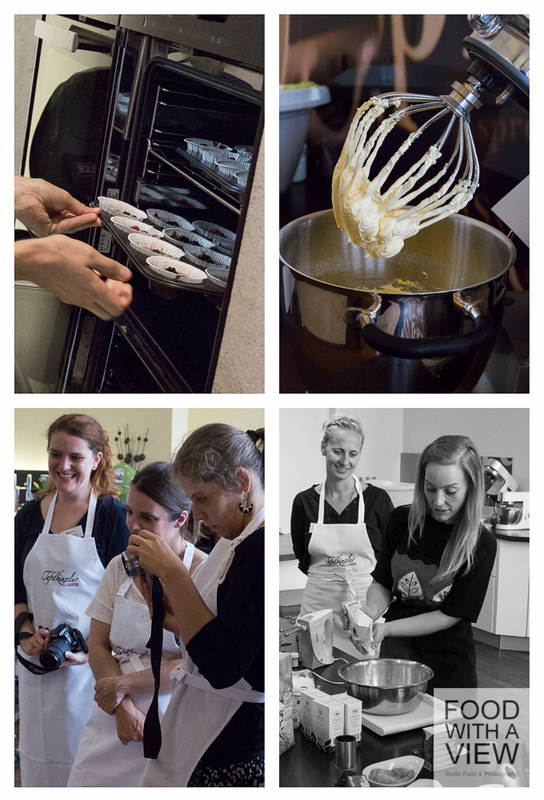 The less trained in vegan baking – like me – thus got first insights, while the more experienced could start to exchange their knowledge. 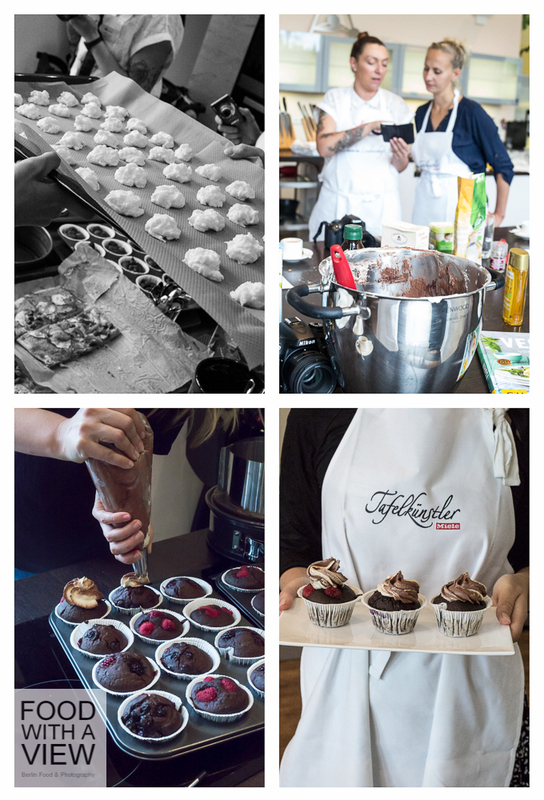 Finally, we were ready for take-off with cupcakes, berries & buttercream, gooseberry & biscuit cake and German coconut macaroons (not to mistake for French macarons) that we prepared in the lovely and quite big location of “Kochschule Berlin”. Most surprising for me was the biscuit experience – the raw dough with soy yoghurt and sparkling water had already been impressing regarding texture, and this was even more true once the dough left the oven, well risen and fluffy. 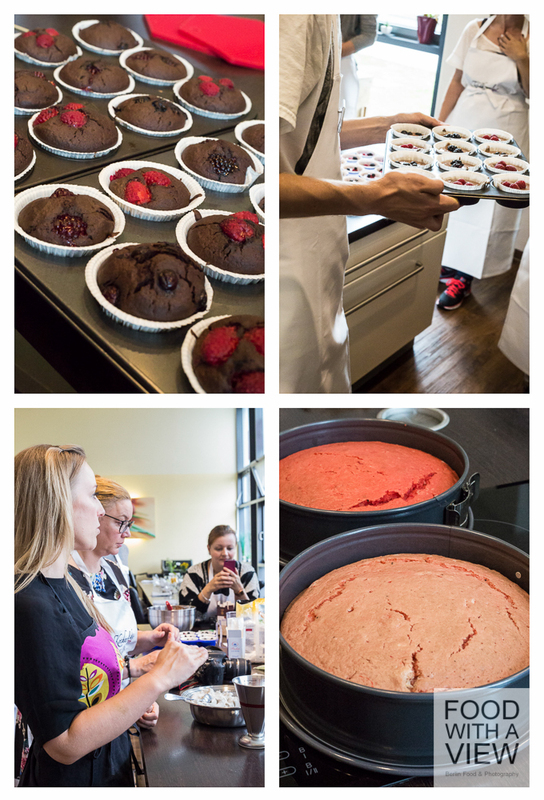 We also prepared sponge dough for the cupcakes with maranta starch as a key ingredient as well as gooseberry jelly with agar-agar and a butter-cream substitute made with margarine. Nicole also introduced us with two special staples of vegan baking: first some coconut pulp that can be whipped to get a delicious cream and second a substitute for egg-white based on tapioka starch and a convenience product from the super market which is vegan cream that can be whipped as well. I had been impressed by the latter’s texture, but the coconut macaroons that came out in the end didn’t fit my personal taste since the starch tasted through quite clearly. Te jellied goosberries became a filling for the rose-colored biscuit dough in the end, topped with coconut cream and lots of multicolor sugar sprinkles, and along with our cupcakes crowned with black & white butter-cream frosting, this made quite a fancy coffee table in the end. I liked both kinds of cake, the biscuit tarte a bit more than the cupcakes, and even though the biscuit had to be filled when still warm (since we were running out of time) and thus got a little moist, I was really excited with its consistency and taste and will surely try this one again. And not the least: having coffee and cake all together, this had been a wonderful opportunity in the end to talk about vegan living and all the rest. Does vegan baking work after all? Yes, that’s indeed my impression – and it’s for the same reasons like in the traditional way of baking: you just make good use of an ingredient’s characteristics. Of course, consistencies and taste differ from recipes using eggs and dairy products – doughs seem to be more dense and the full flavor of butter is missing in the beginning. But I’m fine with that and even like it from time to time – after all, it’s a challenge to work with flavors, isn’t it. Regarding the latter, I’m quite curious to make some experiments beyond lemon, vanilla and cocoa, and I’m excited already what ideas the book will offer – I made some promising discoveries already. There’s two questions left, the first being whether you are willing or not – as a consumer – to use convenience products like vegan whipping cream containing additives. To be honest: that’s not my cup of tea, neither in traditional, nor in vegan baking, and as vegetarian, I can easily make my choice and take dairy cream instead, preferably from organic and regional farming. During the workshop, a little discussion arose if the former is really that „bad“ and the latter that „good“ – would be interesting to deepen the exchange on another occasion. Another point of interest that often comes up when talking about vegan food: how far can you get if you prefer to buy local? Banane makes a moist dough, silken tofu makes the cream a cream and coconut is so lovely for the same purpose. Now what? Maybe like this: mashed apples from regional orchards can do the same job like bananas from time to time, maybe you find some tofu made from local soy bean plants, and there’s no need to use coconut imported from far away every day – and if you do so, you might want to support fair trade products. Be that as it may: For me as a vegetarian, vegan baking has been an interesting experience also because – besides many products I already know – there’s some new foods involved that I need to think about, for example how and where are they produced. Food bloggers usual agenda, after all. I liked the experiment of vegan baking, and many recipes don’t feel as exotic as one might think at first sight. Anybody out there who never prepared a shortcrust for a fruit tarte without eggs and with margarine instead of butter? Well, I did, and Nicole Just has some more ideas than this to offer. I prefer her recipes that don’t use substitutes and create an own space instead, so to speak. 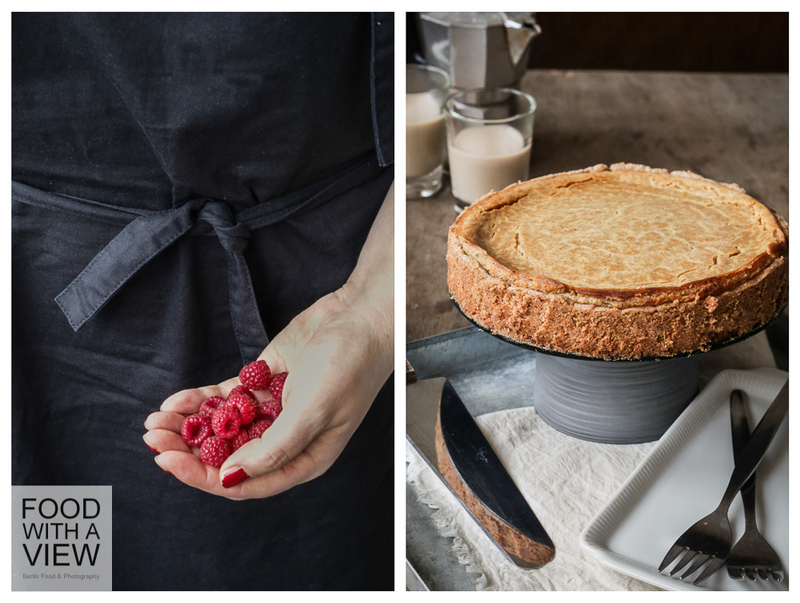 Her joy and creativity have inspired me to further have some cake here and there without dairy products and eggs – there’s obviously many ways to get a fine treat nevertheless. I’m therefor looking forward to some new recipes already – because in the end of the workshop, we got her book as a a present. We also could make our choice from some other newly published Gräfe und Unzer books as well – it felt a bit like guilty pleasure when I chose a non-vegan bakery title indicating lots of butter and eggs in the recipes 😉 . Thanks so much to Nicole and the team of Gräfe und Unzer for an inspiring and well-organized weekend at lovely locations. It has also been a pleasure to meet blogger friends as well as new faces – and not the least thanks a lot to the team for being so interested in our opinions and needs as bloggers and for the insight in a publishing house’s work flow. After all this talking of mine about cake, let’s finally have some, right. 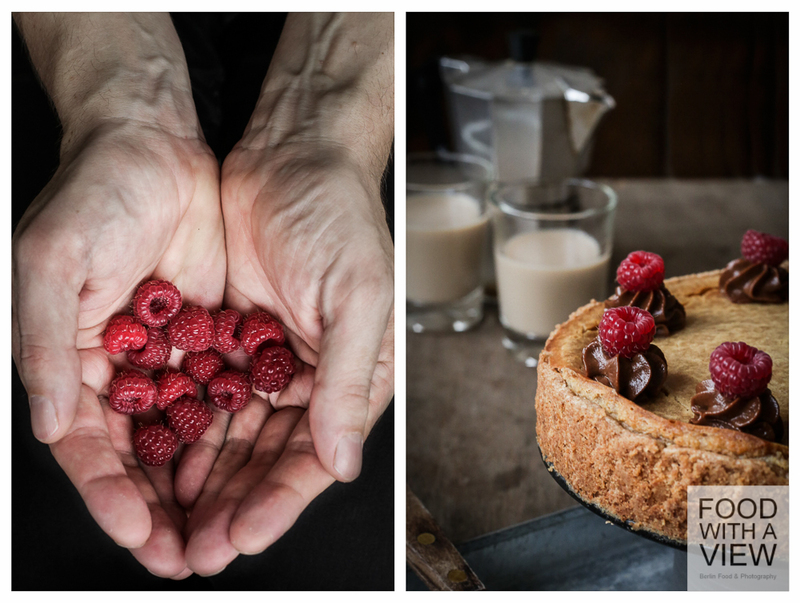 Before I attended the workshop, I discovered a vegan cheesecake recipe on Nicole’s blog and tried it, however I made a few changes. The dough became a bit crumbly, my fault, I guess (I used whole spelt instead of wheat), but since it’s been in the oven for quite some time at comparably low temperature (whatever this means in my hot oven), it had a nice caramel-like flavor. Once chilled, the tofu filling is moist and has a surprisingly fine flavor. I used the double amount of vanilla and some more sugar to get full flavor, otherwise, as newbies to the world of vegan baking, I would have missed the taste of butter. Also, I used less starch than indicated in the original recipe and substituted with the double amount of flour. I liked the cake’s taste a lot with its lemon and vanilla flavors, however it tastes of course otherwise than cheesecake, less tart & fresh. I’m totally fine with this – like I mentioned already, I don’t aim for a copy but for a new experience. 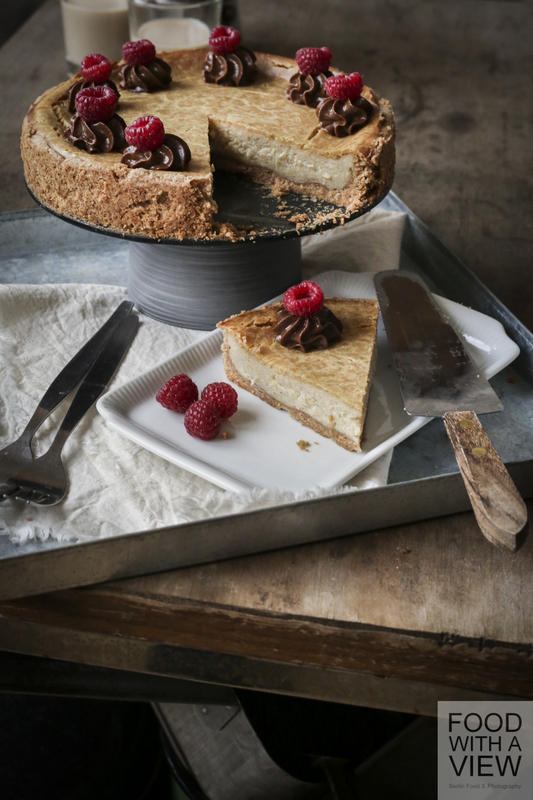 However, the cake has a mouthfeel very similar to cheesecake, I would recommend also to non-vegans to give it a try. By the way: If you wonder about raspberries in late September, don’t worry – on my balcony, I enjoy a late and rich harvest of autumn raspberries, a variety I never heard of before. There could be no bigger contrast between this plant and my bush of blueberries – there have been exactly three berries this season. Enough to crown a single cupcake, at least. * According to indications on the package. I used an organic brand with 17 g for 500 g flour, with another brand, measurements might be different. For the dough, mix flour, sugar, vanilla and baking powder. Add the margarine in small pieces, knead a dough. Grease the springform pan and fill in the dough with your hands, forming a rim also. Cover the form and put into the fridge for an hour. For the filling, put some kitchen towel in a colander, fill in the silken tofu and drain for ten minutes. Fill the margarine into a small pot, gently heat and melt. Mix very finely together with the silken tofu and all other ingredients. Fill the mixture upon the dough in the springform pan and put into the preheated oven (gas). Bake at 180 °C for about 75 minutes. Take off, let cool down to room temperature and put into the fridge for one hour (that’s how we liked it best). Take the cake out of the fridge 15 minutes before serving. For the decoration, finely mix all ingredients besides the raspberries. Fill into a pastry bag with a star-shaped nozzle and spread eight little roses on the cake. Decorate each rose with a berry and serve the cake. Vegan ist angesagt und gilt längst nicht mehr als Domäne übellauniger Genussverweigerung. Tatsächlich kennt fast jeder die herzhafte tierproduktfreie Küche, denn Vieles etwa aus der Mittelmeer- oder Asia-Küche kommt ganz von allein ohne Käse, Sahne & Co. aus. Alles also nicht so schwer, aber beim veganen Backen hört spätestens bei Käsekuchen der Spaß auf. Oder doch nicht? Um das herauszufinden, bin ich genau wie zwei weitere Handvoll Neugierige kürzlich in die Kochschule Berlin nach Berlin-Biesdorf gefahren. 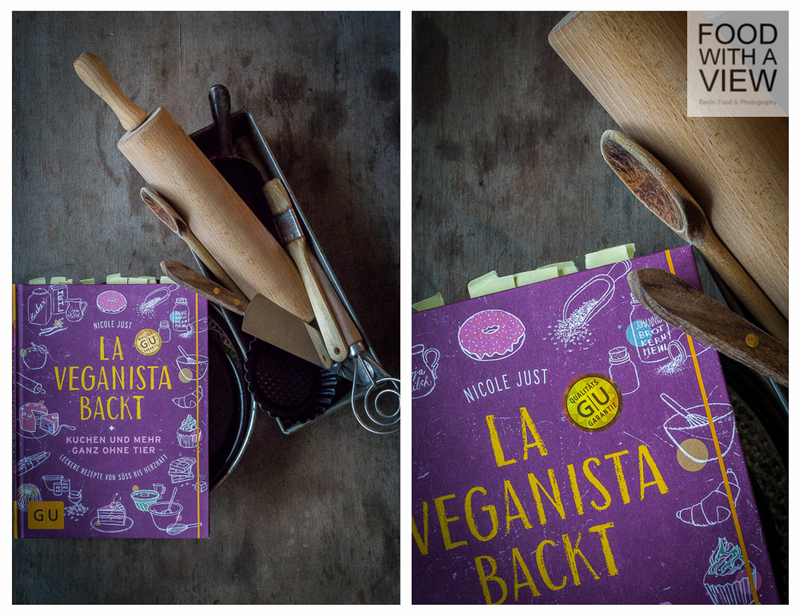 Dorthin eingeladen hatte der Münchner Verlag Gräfe und Unzer Food- und andere Blogger – darunter Veganer und Nicht-Veganer – um gemeinsam mit Nicole Just aus ihrem neu erschienenen Buch „La Veganista backt“ kleine Kuchen, Biskuit und Makronen auszuprobieren. Vor mehr als zehn Jahren habe ich selbst ein Jahr lang ohne Milch & Co. gelebt. Aus dieser Zeit geblieben ist ein gewisses Bewusstsein für tierische Produkte, die ich sehr gern esse, aber immer mal wieder ebenso gern reduziere. Das ergibt sich ganz natürlich und ungeplant – meine Alltagsküche etwa kommt mit wenig Käse und Eiern aus und ist oft sogar vegan. Mit Ersatzkreationen wie Käse ohne Muh und Mäh aber kann ich nicht so recht Freundschaft schließen. Ob die vegane Backstube auf fancy Spezialprodukte oder eine eigene Herangehensweise bauen würde, war für mich daher eine der interessantesten Fragen. Los ging es bereits am Vorabend mit einem Kennenlern-Dinner im Kopps, eine der gehobenen veganen Adressen der Stadt. Dort konnten wir uns nicht nur thematisch einstimmen, sondern auch einander kennen lernen und das freundliche GU-Team rund um Claudia Uhr, Leiterin der Abteilung Presse, PR & Social Media, alles fragen, was wir über die Arbeit einer Kochbuch-Redaktion wissen wollten. Dazu fällt Food-Bloggern naturgemäß eine Menge ein, und so wurde es ein längerer und spannender Abend. Vom Menü inspirierend im Gedächtnis geblieben sind mir der aparte Gruß aus der Küche bestehend aus einem würzigen Linsen-Gebäck mit aromatischem eingelegtem Kohl, eine köstliche Feigen-Tomaten-Suppe und ein fein-fruchtiger harmonischer Grauburgunder aus dem Hause “Hand in Hand”. Am folgenden Backtag hatte unsere Gastgeberin Nicole glücklicherweise bereits mit frischen grünen Smoothies und einem herzhaften Snack dem verfrühten Zuckerschock vorgebeugt. In den schönen und großzügigen Räumlichkeiten der Kochschule erzählte sie uns zunächst aus ihrem Leben als Bloggerin (Vegan sein), Betreiberin des Dinner-Clubs MundArtBerlin, Autorin und Reisende in Sachen veganer Küche – und natürlich von den Besonderheiten veganen Backens. Dass zum Beispiel die Frage nicht sei, wie man etwa Ei ersetzen würde, sondern welche der zahlreichen Möglichkeiten von Apfelmus bis Sojamehl die jeweils passende für ein Rezept sei oder dass man viele vegane Teige nicht zu homogen verrühren dürfe, da sie sonst nicht aufgehen würden (für das Auflösen letzter Klümpchen im Ofen sorgt Sprudelwasser). Erste Aha-Effekte vor allem bei denen, die wie ich kaum vegane Backerfahrung haben, kleine Fachsimpeleien bei den bereits Geübteren – und große Lust bei allen, nun loszulegen mit Cupcakes mit Beeren & „Buttercreme“, Stachelbeer-Biskuit-Torte und Kokosmakronen. Spannend wurde es zunächst beim Biskuit, der mit Sojajoghurt und Mineralwasser zubereitet wird: War die Konsistenz des noch rohen Teiges bereits beachtlich, sollten wir alle nach dem Backen noch mehr angetan sein, denn der Mädchen-Traum in Rosa (mein erster Einsatz ever von Lebensmittelfarbe) ist unglaublich gut aufgegangen. An anderen Stationen wurden Schokoladen-Rührteig mit Pfeilwurzelstärke, Stachelbeer-Gelee mit Agar-Agar oder veganer Buttercreme-Ersatz auf Basis von Margarine hergestellt, der eine schöne, füllige Konsistenz hatte. Zwei weitere Ah- und Oh-Basics waren Kokosmuß, das aufgeschlagen eine leckere sahne-ähnliche Creme ergibt, sowie Eiweiß-Ersatz auf Basis von Tapioka-Stärke und veganer aufschlagbarer „Sahne“ aus dem Supermarkt. Die luftige Masse hatte mich optisch beeindruckt, die daraus gebackenen Kokosmakronen trafen aber meinen persönlichen Geschmack wegen des deutlichen Stärke-Aromas nicht so sehr. Die gelierten Stachelbeeren wanderten am Ende zwischen die rosa Biskuit-Böden, getoppt von der Kokoscreme und bunten Streuseln, und zusammen mit den Cupcakes mit zweifarbigen Buttercreme-Hauben ergab das eine quietschbunte Kaffeetafel, an der wir uns gespannt niederließen. Geschmeckt hat mir persönlich beides gut, die Torte noch mehr als die Küchlein, und auch wenn der Biskuit aus Zeitgründen noch warm hatte gefüllt werden müssen und daher etwas klitschig war: Der hat mich begeistert und wird unbedingt demnächst nachgebacken. Und führt man nicht überhaupt die besten Gespräche bei Kaffee und Kuchen? Die lange Tafel war noch einmal eine schöne Gelegenheit am Schluss, miteinander über das vegane Leben und alles andere zu sprechen. Ja, meinem Eindruck nach sogar recht gut, weil man sich genau wie bei der Verarbeitung tierischer Produkte die Eigenschaften der verwendeten Zutaten zunutze macht. Natürlich kommen dabei etwas andere Konsistenzen und Geschmäcker heraus, die Teige scheinen mir im Schnitt etwas fester und erst einmal weniger gewohnt-vollmundig zu sein. Dass aber zum Beispiel Margarine nicht wie Butter schmeckt und Sojajoghurt nicht wie Ei, muss dabei kein Manko sein, sondern kann den kreativen Umgang mit Aromen ja anregen. Bei letzterem würde mich ein bisschen mehr Wagnis über Zitrone, Vanille und Schokolade hinaus interessieren, und ich bin schon gespannt, was in dieser Hinsicht das Buch zu bieten haben wird – ich habe da schon einiges entdeckt. Eine Frage der eigenen Vorlieben als Konsument wiederum ist, ob man beim veganen Backen Convenience-Produkte wie vegane „Sahne“ mit Stabilisatoren und Aromen verarbeiten möchte. Mein Fall ist das eher nicht, aber als Vegetarierin habe ich es da auch leichter und kann zu Kuhsahne greifen, am besten bio und regional. Die Frage, ob das erstere so schlimm und das zweitere wirklich so frei von unerwünschten Inhaltsstoffen sei, flackerte während des Workshops kurz auf, und es wäre spannend, sie bei anderer Gelegenheit gemeinsam zu vertiefen. Das gilt auch für die oft im Zusammenhang mit veganer Lebensweise diskutierte Frage, wie regional und saisonal ich als vegane Bäckerin konsumieren kann. Immerhin ersetzt zum Beispiel Banane Ei, Seidentofu macht die Creme cremig und Kokos ist schön sahnig – und jetzt? Vielleicht so: öfter mal Apfelmuß mit Äpfeln aus der Region statt Banane, Tofu aus lokalen Sojabohnen und Kokos nicht unbedingt täglich und am besten Fair Trade. Einen tollen Hinweis in dieser Hinsicht habe ich mir aus “La Veganista backt” schon abgeschaut: Rübenzucker von hier statt Rohrzucker von weit weg. Für mich als Vegetarierin ist der Versuch veganen Backens jedenfalls auch deshalb spannend, weil ich neben den meisten vertrauten Zutaten hier und da meine gewohnte Produktpalette verlassen und mir neu Gedanken machen muss. Das Experiment hat mir Spaß gemacht, und bei vielen Rezepten fühlt sich veganes Backen nicht so exotisch an, wie man vielleicht denken würde. Eine Obsttarte etwa mit Mürbeteig ohne Ei und auf Margarine-Basis haben bestimmt Viele schon mal gebacken, und darüber hinaus geht durchaus mehr. Mich persönlich sprechen vor allem die Rezepte an, die nicht auf den Ersatz vertrauter Genüsse bauen, sondern die etwas ganz Eigenes darstellen. Mit ihrer kreativen Spielfreude hat die Autorin mich jedenfalls angesteckt, nicht immer, aber öfter mal Alternativen zu Ei und Butter auszuprobieren. Deshalb freue ich mich schon auf Pralinen-Minitorte, Mango-Marzipan-Tarte, Erdnuss-Biscotti mit Salz-Karamell und vieles mehr, denn das Buch gab es am Ende als Geschenk mit auf den Weg, zusammen mit einem weiteren Genuss-Titel nach Gusto aus dem aktuellen GU-Verlags-Programm. 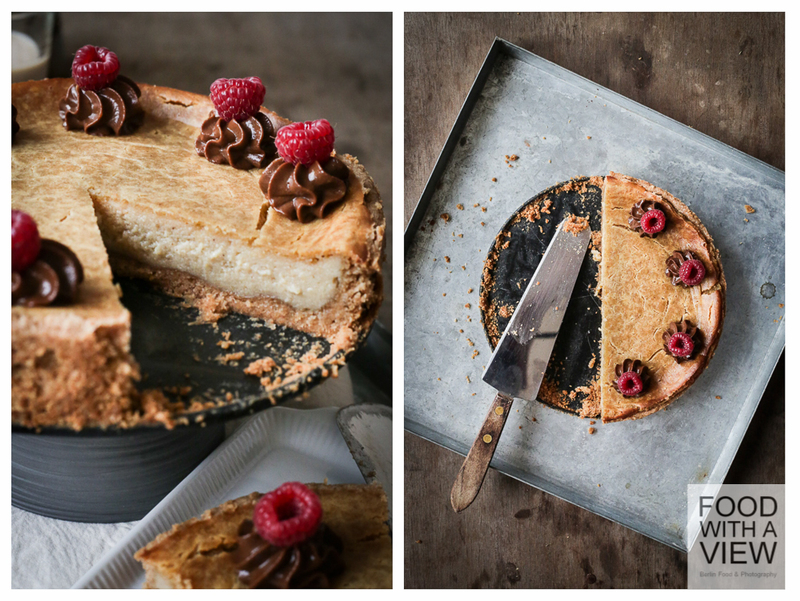 Fast ein bisschen frevelhaft habe ich mich gefühlt, als meine Wahl auf „Lust auf Backen“ von Hannes Weber fiel – die Rezepte zu den wunderschönen Fotos darin sind prall gefüllt mit Ei, Butter und Sahne 😉 . Ich bin gespannt auf beide Bücher, zu denen sich nach Aufteilung eines kompletten Törtchen-Backsets durch vier noch Martin Schönlebens tolle “Mini-Törtchen” gesellten – alle drei werde ich Euch hier noch genauer vorstellen. Nicole sowie dem Team von GU und Teubner sage ich herzlichen Dank für ein inspirierendes und gut organisiertes Wochenende. Wie immer bei solchen Gelegenheiten war es toll, Blogger-Kolleginnen wiederzusehen und neue Gesichter kennenzulernen, darunter natürlich Melanie von Mangoseele, mit der zusammen ich gekommen war (nochmals lieben Dank für die Empfehlung, Melanie), Franziska von Dynamite Cakes, die ich kurz zuvor schon beim AEG-Foodpairing-Workshop kennen gelernt hatte, Karin von Bee Change, Tamara und Sebastian von Simply Vegan oder Stefanie von Kochtrotz, mit der gemeinsam ich Biskuit rühren durfte. Schön fand ich nicht zuletzt auch, dass das gesamte Verlags-Team intensiv das Gespräch mit uns Bloggern gesucht hat – welche Themen uns bewegen, was unsere Erfahrungen sind – und umgekehrt Einblicke in die Arbeit der Redaktion mit ihrer Autorin gegeben hat. Auch für diesen Austausch ein Dankeschön. Nach dem Bericht von der tierfreundlichen Kuchenschlacht will ich Euch jetzt natürlich auch noch ein Rezept vorstellen. Das habe ich am Vorabend des Workshops hier auf Nicoles Blog entdeckt und gleich danach mit kleinen Veränderungen und umgerechnet auf eine kleine Springform ausprobiert. Ein ähnliches Rezept ist auch im Buch enthalten, allerdings mit einer zusätzlichen Fruchtmasse, weshalb die Zusammensetzung insgesamt dort anders ist. Für mein Empfinden schmeckt der Kuchen lecker zitronig-vanillig, aber natürlich anders und auch weniger säuerlich-frisch als ein Käsekuchen (und darf das in meinen Augen wie gesagt auch – mir geht’s nicht so sehr um’s Nachahmen). Mit dem namentlichen Vorbild teilt der Kuchen aber das cremige Mundgefühl – ich finde, er ist auch für Nicht-Veganer einen Versuch wert. Und bevor mir übrigens Saison-Klagen kommen wegen der Himbeeren Ende September 😉 : Die stammen von meinem Balkon, auf dem ich mich derzeit einer reichlichen Herbsthimbeeren-Ernte erfreue. Ich wusste gar nicht, dass es diese spät zündende Varietät überhaupt gibt und dass sie so ertragreich ist – ganz im Gegensatz zu meiner Heidelbeere, die dieses Jahr genau drei Früchte getragen hat. Hätte immerhin für einen Cupcake gereicht. * Laut Packungsanweisung. Ich verwende ein Biobackpulver, dass 17 g auf 500 g Mehl vorsieht, dies kann bei einer anderen Sorte anders sein. Für den Teig Mehl, Zucker, Vanille und Backpulver mischen. Margarine in kleinen Stücken zugeben, alles zu einem Teig verkneten. In die gefettete Form geben, dabei einen Rand hochziehen. Abdecken und für eine Stunde in den Kühlschrank stellen. Für die Füllung ein Sieb mit Küchenpapier auslegen. Seidentofu hineingeben und 10 Min. abtropfen lassen. Margarine in einem Topf erwärmen, bis sie flüssig ist. Mit dem abgetropften Seidentofu und allen anderen Zutaten fein pürieren oder mixen. Masse in die Springform auf den Teig gießen und im vorgeheizten Ofen (Gas) bei 180 °C ca. 75 Minuten backen. Erst auf Zimmertemperatur abkühlen lassen, dann für eine Stunde in den Kühlschrank stellen. Kuchen 15 Minuten vor dem Servieren aus dem Kühlschrank nehmen (hat uns so am besten geschmeckt). Für die Dekoration alle Zutaten bis auf die Himbeeren pürieren und die Masse in eine Dekorspritze mit Sterntülle füllen. Außen herum 8 Röschen auf den Kuchen spritzen, jedes Röschen mit einer Himbeere dekorieren. Vielen Dank, liebe Julia! Das freut mich, dass Dich mein Post auch als jemanden angesprochen hat, die einen kritischen Blick auf das Thema hat. Ich sehe es wie Du – und suche mir daher die Rezepte und Komponenten heraus, die meine Ansprüche an Zutaten ohne Zusatzstoffe und aus der Region erfüllen. Das scheint tatsächlich zu gehen und ist für mich neu und spannend – und das nicht-vegane Backen wird natürlich auch seinen Platz hier behalten, dafür sorgen schon die zwei anderen Bücher, die ich mitnehmen durfte ;-). Thanks a lot, Laura! I agree with you on textures and flavors – it’s quite different from baking with butter & co. and needs some experiments with ingredients that bring the full flavor in. 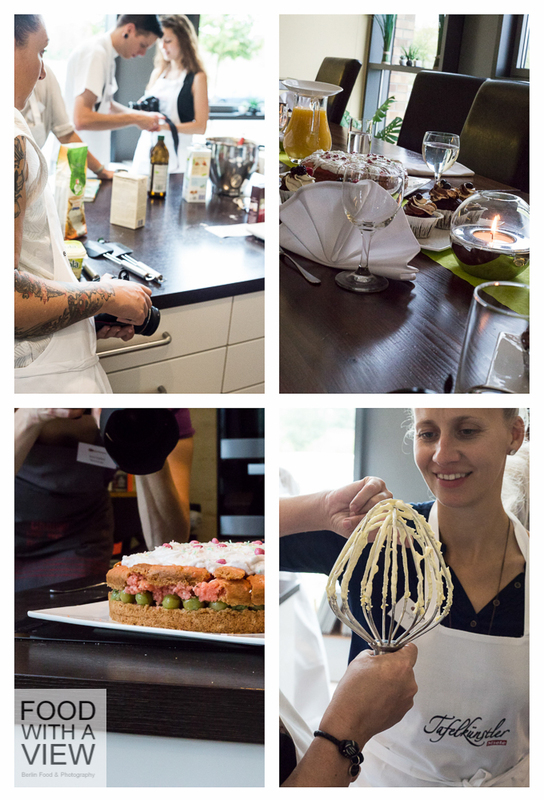 Great that you do some vegan baking for your friends, I’m sure that you are doing a very good job in this :-). 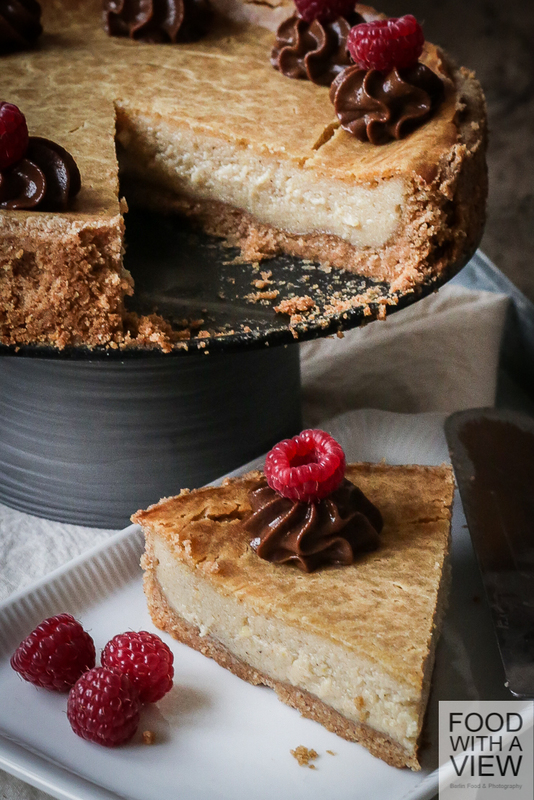 I guess cashew and nut creams in general are great in vegan cakes – I already thought to try this “cheese”cake with a tofu & nuts/almonds mixture next time to get more flavor in. So let’s keep an eye on interesting developments in vegan baking & cuisine alike – I won’t change sides completely, but it’s indeed interesting for many reasons. Best and hugs! Ich schließe mich an – ein wirklich spannender Artikel, auch, wenn ich selbst nicht so viel Anlaß habe, mich mit veganer Bäckerei zu beschäftigen……interessiert bin ich trotzdem. Vielen Dank, Susanne. Ja, ich backe derzeit so viel wie lange nicht mehr, da kommt hier also noch einiges ;-), sowohl vegan als auch nicht vegan. Liebe Claudia, ich bin sehr beeindruckt, wie wunderschön diese Torte geworden ist. Ich habe nie auch nur ansatzweise in Erwägung gezogen beim Backen auf tierische Produkte zu verzichten, verstehe aber, dass es so manchen ein Anliegen ist. Den Rübensirup habe ich schon lange auch für mich entdeckt, aber mein absoluter Favorit beim Süßen heißt “Apfeldicksaft”. Den liebe ich. Ich bin gespannt, was du noch so alles backst..
Lieben Dank, Claudia! Es ist beim Backen auch tatsächlich weniger einfach, mal ohne Tier auszukommen, als beim Kochen – bei Letzterem ergibt es sich ja manchmal ganz von selbst. Den einen oder anderen weiteren Versuch werde ich hier bestimmt posten, ich bin selbst gespannt. Deinen Tipp mit Apfeldicksaft merke ich mir – noch nie benutzt, dabei ist das so naheliegend, im wahrsten Wortsinn. Thank you, Afra! I’m happy that you like it :-). Wow sieht das gut aus! Ich versuche ebenfalls, so gut es geht beim Backen auf tierische Produkte zu verzichten. Manchmal gar nicht so leicht. Aber wenn man, wie du schon gesagt hast, nicht den Anspruch hat, bekannten nachzuahmen, kommen da immer wieder die leckersten Kuchen bei raus. Vielen lieben Dank für das tolle Rezept! Lieben Dank, Nele! Dein Kommentar klingt so, als hättest Du einige Erfahrung im veganen Backen – für mich ist das noch eine Herausforderung :-). Dass Nicoles Rezept Dir gut gefällt, freut mich (und sie bestimmt auch). This is probably the best looking “cheesecake” I have ever seen. You definitely have got me curious to know what the tofu filling tastes like. Pinned! Thanks a lot, Thalia! Hope you will like the filling. The recipe itself is by Nicole with a few changes of mine, and I would recommend to try and substitute some of the tofu with nut cream (cashew, almond, whatever) like mentioned in Lauras comment also. 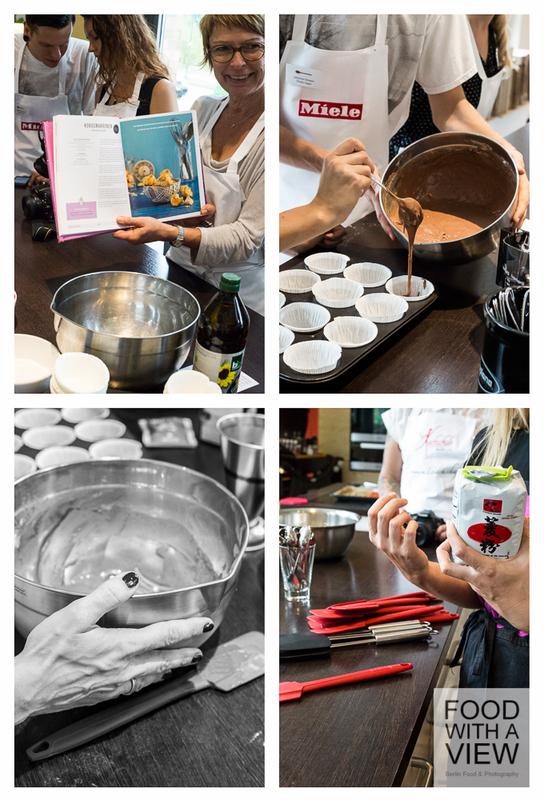 Have much fun with the recipe! Thanks a lot, Jasmin! Great that you like both the cake and the pics. Das macht doch nix, liebe Melanie, ich kenne die Zeiten auch, in denen man nicht zum Kommentieren kommt. Ich hoffe, dass Du eine tolle Zeit mit Deinem Besuch hattest. Das freut mich, dass Dir der Kuchen gefällt – ich würde empfehlen, in der Füllung zusätzlich Nuss- oder Mandelmus zu verwenden, siehe andere Kommentare dazu.